A complete set of all 6 pieces. 2018 COMPLETE SET OF 6. MATCHED NUMBERS! Hermann- Spielwaren GmbH, Coburg, ornaments. 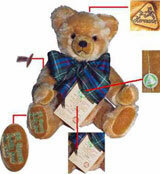 "Miniature Bears stuffed with excelsior belong to the rarity treasure of the Teddy Bear world and can hardly be found today at the collectors market. For almost 100 years, we have cultivated the tradition of stuffing our Teddy Bears with excelsior and we have preserved for us this old craftsmanship also for the production of our Miniatures. This gives our Miniatures their exceptional value and makes them incomparable and unique." These 6 beautiful hand-made, fully jointed miniatures are hand-made of rich high-grade German mohair with traditional excelsior stuffing. Each is 13 cm, 5.25 inches tall. Each Ornament comes in its own transparent gift box.